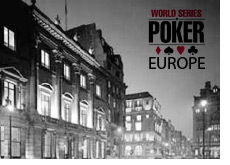 The second World Series of Poker Europe event will take place between September 19th and October 1st of 2008, Harrah's Entertainment announced on Tuesday. The event will be held at the same three casinos that hosted the event last year in London, England - the Fifty, The Casino at the Empire and the Sportsman. The event will once again be hosted by Betfair, and will undoubtedly include the participation of signed Betfair players Annette "Annette_15" Obrestad and Sorel "Imper1um" Mizzi. Obrestad shocked the poker world when she took down the inaugural main event of the WSOPE last year, collecting over $2 million dollars US in the process. Based on the success of the event last year, I would expect an even higher turn-out this year. It is unknown whether or not the WSOPE will have the same number of events that they had last year. More specific details are to be released at a later date, according to Harrah's. This event is looking to be a great supplement to the World Series of Poker that runs in the United States. I would imagine that this event will grow with each passing year, especially as poker continues to catch on in Europe and other parts of the region. This event will also benefit from the fact that you only need to be 18 years of age to play, which means that phenoms such as "Annette_15" will be able to participate in the event. The WSOP events in the US exclude many of the top young players in the world, due to the fact that you need to be 21 years of age to compete.